Today, the fragility of a ‘cosmopolitan EU’ construct lies exposed by the austerity driven xenophobia, rise of the right-wing movements and ideologies, state surveillance and disciplining as well as disintegration dynamics. EU’s global image as a beacon of cooperation and advocate of human rights is showing gaping cracks. It fails to constructively address the so-called refugee and migration crisis; it fails to build parity-based relations with the newer/poorer and non-EU member states; it fails to resolve the growing inequalities between and within its member states. Having claimed a monopoly on the term ‘Europe’, the capitalist rulers of the EU exclude the diversity of the peoples they claim to bring together in deciding what EU is or should be. Globally too it fails to lead the peace talks while escalating geopolitical conflicts. Their climate change action leadership is riddled with contradictions rooted in market based solutions. Amidst this crisis and transmutations, new alliances and solidarities are being built, alternative forms of governance are being forged. The fragmented left is alive yet while it celebrates revolutionary opportunities, it fails to mobilise social and political power potent enough to overturn the drift to the right. At the same time, on the level of grassroots, communities organise alternative ways of meeting their social reproduction needs (and beyond) where states and markets keep failing. The aim of this workshop is to question our understanding of what Europe constitutes, how and for whom it works and for whom it does not. We would like to zoom in on the reconfiguration processes in European societies that bring together communities ripped apart by neoliberal policies and politics. 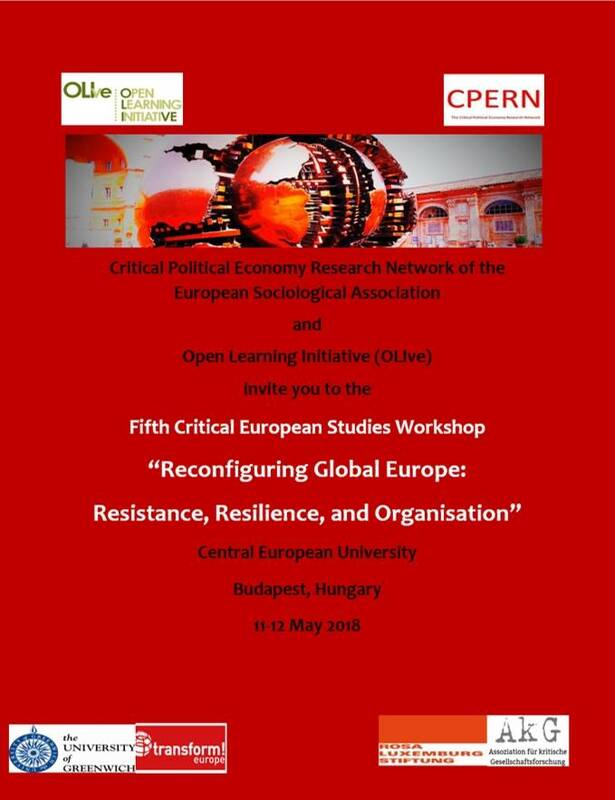 The workshop follows previous CES workshops held at the University of Frankfurt (2017), the University of Greenwich in London (2016), at the Universitat Pompeu Fabra in Barcelona (2015), and at the Vrije Universiteit Amsterdam (2014), put together with the support of CPERN scholars and the Arbeitskreis kritische Europaforschung (AkE/AkG), RLS, Transform! and the University of Greenwich Business School. In order to foster a constructive debate the workshop will avoid individual paper presentations and foregrounds collective discussions instead. We will proceed on the basis of thematic block sessions, with each tabling a core text that all participants will have read beforehand. Each of the sessions in the workshop starts with a brief introduction, and participants discussing and enhancing the perspectives developed in that session’s core text from the angle of their own research/activism. This is followed by a mumble where all participants share their ideas in small groups, after which the floor is opened for a plenary discussion. Coretext: Pósfai, Zsuzsanna, Zoltán Gál, and Erika Nagy. "Financialization and inequalities." Coretext: Novak P. (2017) ‘Back to Borders’, Critical Sociology, Volume: 43 Issue: 6, page(s): 847-864.